James Gordon Bennett, Jr.: Sports enthusiast, owner of the New York Herald newspaper and financier. August Heinrich Petermann: German cartographer whose theory helped spawn the polar expedition. George W. De Long: Commander of the expedition and officer in the United States Navy. Charles W. Chipp: Lieutenant in the United States Navy and De Long's second-in-command. George W. Melville: Engineer, explorer, and officer in the United States Navy. Chief of the Bureau of Steam Engineering. John Wilson Danenhower: Explorer and officer in the United States Navy. Time; 'In The Kingdom of Ice' brings cold comfort. The New York Times; Abandon Ship! The Miami Herald; 'In the Kingdom of Ice' recreates a disastrous Arctic voyage. USA Today; Crack into this harrowing 'Ice' survival tale. 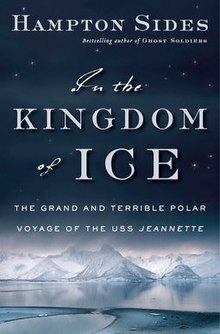 The Christian Science Monitor; 'In the Kingdom of Ice' follows a disaster-ridden journey to the North Pole. The Washington Post; Book review: “In the Kingdom of Ice”. The Los Angeles Times; 'Kingdom of Ice' uncovers a polar adventure frozen in time. The Wall Street Journal; Book Review: 'In the Kingdom of Ice' by Hampton Sides. Daily Mail; Russian bid to raise wreck of US Navy ship. The Huffington Post; What Can a 19th Century Arctic Shipwreck Tell Us About the 21st Century's Most Wicked Problem? The Diane Rehm Show; Hampton Sides: “In the Kingdom of Ice”. Weekend Edition (NPR); In 1879, Explorers Set Sail To Solve Arctic Mystery, Once And For All. The Wall Street Journal; Why an 1879 Voyage Is a Time Machine for Climate Change. Imus in the Morning; A survival story of polar exploration in the Gilded Age.